In the summer of 2014, C. S. Friedman, one of my favorite SFF authors of all time, invited me to get an early read of her upcoming Dreamwalker. All that she and her editor, Betsy Wollheim, asked for was for me to refrain from revealing anything about it and to wait till around the book's pub date before posting a review. As always, I was happy to oblige. When asked to describe the book, Friedman explained that it was a crossover novel. It included elements targetted to a teen audience, but also hopefully enough content and complexity that would please an adult audience. It turns out that writing the Magister trilogy had taken a lot out of the author and she needed a break from that sort of tale. Indeed, that series was by far her most densely written, aggressively dark, and adult-themed work, and it took six years of her life to write. As a result, Friedman wanted to write something shorter, something more linear, with a plot that wasn't as convoluted, with a much faster pace. Something that her younger fans could relate to a bit more. And yet, she also wanted to write something her adult fans would enjoy as well. Sounded like a good plan, or so I thought. What I immediately realized when I started Dreamwalker was that in style and tone it was a world away from the dark science fiction and fantasy series/novels Friedman has become renowned for. And no matter from which angle you looked at the plot, it was YA through and through. When I mentioned this, they requested that I kindly refrain from using the terms YA or young adult in my review of the book. The rationale was, understandably, that such a label could potentially alienate a good chunk of Friedman's readership. The problem with this strategy is that, if the online customers/readers' reviews are any indication, a vast number of people believing that they would experience more of Friedman's awesomeness felt cheated to have forked out their hard-earned money for what turned out to be a YA novel. Unlike Joe Abercrombie's YA series, in which the author's wit, cynicism, and the dark humor that characterize his backlist were all present, if a little subdued, the same couldn't be said of Dreamwalker. The YA label demanded that the violence be not as graphic as usual, with less blood and gore, true. That trilogy was definitely an Abercrombie series, but it showed a more self-restrained Joe Abercrombie, one that pulled some of his punches and didn't go all out the way he did in his adult novels. On the other hand, C. S. Friedman's latest was a totally different creature, one that had very little in common with her previous books. And in the end, Dreamwalker didn't perform as well as they had hoped for. Here was a YA title whose target audience was the extremely lucrative YA market. Yet there was no mention of it being a YA work, it was released by a non-YA publisher, and it wouldn't even appear in the YA section of bookstores around North America. Moreover, it received basically no coverage from YA resources. Hence, not only did some of Friedman's long-time fans felt short-changed by this strategy, but the book's target audience was more or less never reached. Which brings us here, to this second volume. It must be quite frustrating for the author. Dreamseeker just came out and a percentage of her fans won't even touch this novel with a ten-foot pole. Even worse, the market it's aimed at is unaware of its existence. Or that if its predecessor, for that matter. C. S. Friedman has revised her plans and this series is now officially a trilogy. She will wrap up everything in the third installment. Her next work will be set in the same universe as the novel This Alien Shore. When Jessica Drake learned that her DNA didn’t match that of her parents, she had no idea that the search for her heritage would put her family’s lives in danger, or force her to cross into another world. In an alternate Earth dominated by individuals with unnatural powers called Gifts, Jessica learned that there was a curse within her blood, one so feared that all who possessed it were destroyed on sight. For she was a Dreamwalker, and the same dark Gift that would allow her to enter the dreams of others would eventually destroy her mind and spread insanity to all those around her. Now she is back with her family, but there is no peace to be found. Her childhood home has been destroyed, her mother’s mind is irreparably damaged, and the Gift of the Dreamwalkers is beginning to manifest in her in terrifying ways. When a stranger invades her dreams and creatures from her nightmares threaten to cross into the waking universe, Jessica knows she must return to the alternate Earth where she was born and seek allies… even if doing so means she must bargain with those she fears the most. Dreamseeker is the gripping sequel to C.S. 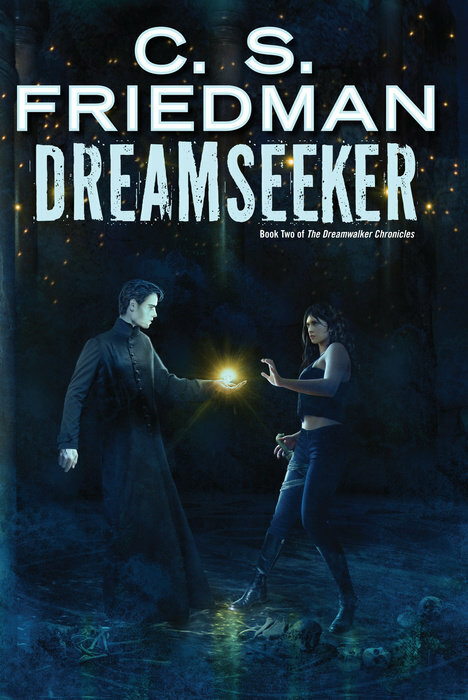 Friedman’s Dreamwalker. Worldbuilding has always been a facet in which Friedman habitually shines. But by specifically trying to write something less dark and complex, I felt that there was a certain lack in that aspect of her writing when I read Dreamwalker. And yet, the novel was just a brief introduction to what will be a bigger, more intricate tale, and the potential for more complexity and more darkness was definitely there. Only time would tell if, as is the author's objective, said complexity and darkness would build over the course of the series. And in that regard, I'm pleased to report that the author has upped her game in this second volume. Lots of readers complained about things that felt like weird coincidences within the pages of Dreamwalker. There are quite a few revelations which make you realize that these were no coincidences at all. In addition, Dreamseeker is a darker sort of tale than its predecessor. Not as dark as Friedman's previous works, but much darker than the first installment. We discover a lot more about the inner workings of the Guild of Shadows through Isaac's storyline, which adds more depth to this story. Although the bulk of Dreamwalker was made up of Jessica Drake's point of view, there were a number of POVs that created a good balance throughout the novel. She took center stage, but still Jesse was forced to share the spotlight with her brother Tommy, as well as her friends Rita, Devon, and Isaac. I believe that having such a well-balanced characterization helped moved the tale forward and made for a more enjoyable reading experience. The same cannot be said as far as this second volume is concerned, however. The plot has its own demands and this tale is mostly told from two perspectives, that of Jesse and Isaac, and therein lies the problem. Some could see this as a case Friedman falling short somehow in depicting the characters. Which is not the case. As a writer, I feel that Friedman did everything right. Both Jesse and Isaac are well-drawn, three-dimensional characters that remain true to themselves. It's just that on their own, they're not as interesting and fun to follow as they were when they were part of the group. It's not like the author somehow screwed up the characterization. They are who they are, with genuine personalities. But when Jesse and Isaac are forced to carry the entire tale on their shoulders, independently they're not as compelling protagonists as they were as a collective unit. Can't really explain it better than that. . . In terms of pace, Dreamseeker is not as fast-moving as the first volume. Adding layers and infusing more darkness to the overall story arc while following two independent plotlines slow down the rhythm a bit, but the relatively short chapters, engaging protagonists, and surprising revelations keep you turning those pages. Based on Dreamwalker, it was evident that this was a series brimming with potential. Upping her game in this second installment, C. S. Friedman promises a kickass finale to come in the third volume! Friendship and family appear to be two underlying themes explored in Dreamseeker. We discover more about the Dreamwalkers and that their disappearance might be linked to the Guild of Shadows. We also learn more about various alternate realities. Essentially, Friedman builds on all the groundwork she laid out in the first installment, fleshing out a lot of the concepts and characters she introduced in Dreamwalker. And though the perspectives of Jesse and Isaac were not as interesting as the multiple POVS from the previous book, Dreamseeker sets the stage for what should be a fun endgame. I know you're not a YA kind of guy, Pat. So if this wasn't Friedman, would you have read these books? Do you think they're good compared to other YA book? As I told Celia, I would never have read DREAMWALKER and DREAMSEEKER if they hadn't been written by her. As far as how it compares with other YA titles, I can't really say. As you mentioned, I'm not too keen on YA fare, so I'm the wrong person to ask how good or bad these books are compared to their competition. The first one was nice enough, but not worth the hardback price. Will wait for the paperback next year. We (DAW Books) would have like to be able to market this series to the YA readership (and have it available in the YA sections of stores) as well as the adult readership, but alas, the major bookstore chains refused to carry the book in both sections, and the YA buyers wouldn't buy it because our company was too well associated with adult SF/F. We were hobbled by the bookstores. Just thought you all should know, and also know that Friedman is returning to her usual complex dark adult work.